In October 2014, the Laramie County Commissioners created the Laramie County Control Area Steering Committee and appointed 29 members representing water users in the county, economic development interests, water conservation interests, and experts in water use and allocation. The Commissioners charged the Steering Committee to develop creative and effective options for reducing water use in the control area. The Steering Committee has a deadline of April 1, 2015 to craft such measures, which will be forwarded to the Laramie County Control Area Advisory Board and the State Engineer for consideration. Control Area Groundwater Management Plan Produced by the Laramie County Control Area Steering Committee in March 2016. In the face of declining groundwater levels in the High Plains aquifer system in southeastern Wyoming, the State Engineer declared the eastern two-thirds of Laramie County to become a Groundwater Control Area – a special groundwater management district – in 1981. The Laramie County Control Area stretches from Cheyenne east to the Nebraska border, south to the Colorado border, and north to Platte and Goshen Counties. The High Plains aquifer system underlying most of Laramie County has been heavily used since the 1970s. In the Control Area, an application for a new water right or a petition to amend an existing water right may be subject to public notice, objections from existing water right holders, and hearings. After 33 years as a “control area”, the water levels in the High Plains aquifer have continued to decline, especially in the eastern and southeastern part of the county. Responding to mounting concerns over increasing development and use of groundwater resources, the State Engineer issued a Temporary Order Adopting Well Spacing Requirements within the Laramie County Control Area on April 11, 2012. 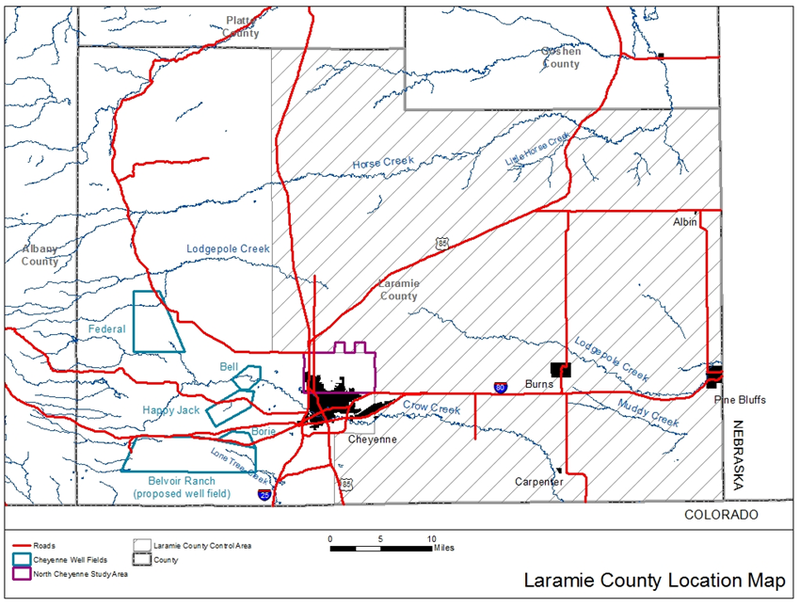 The Order temporarily limits groundwater development in the Laramie County Control Area. The order establishes well spacing restrictions (horizontally and vertically), as well as use limitations for most new groundwater applications in the Control Area. Laramie County now faces the issue of how to sustainably manage an aquifer that is an important resource to its residents, especially the agricultural community, which has seen the most dramatic declines and relies on groundwater for its viability. The State Engineer has the authority under state law to regulate the use of the groundwater source in the control area by closing the control area to further water well permitting, placing caps on production, regulating wells by priority or developing a system of rotation of uses. Wyoming state law also provides the opportunity for water users in the control area to develop their own alternative to a state engineer's order. A local agreement can invoke the tools available to the State Engineer, but is far more flexible and could include incentives, programs and other creative options to reduce water use in ways that the State Engineer is not empowered to do.A requirement in statute is that a locally led agreement must not injure any party not signatory to it, nor be detrimental to the public interest.